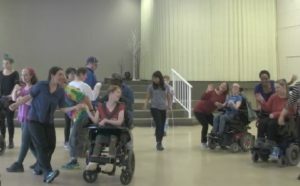 A new inclusive dance group is starting on September 20th, 2018. The cross-disability dance group is for adults who are interested in teamwork, moving creatively, having fun, and respecting each other’s boundaries. Sessions are on Thursdays from 1:00pm-2:00pm during the Fall, followed by rehearsals and a sharing in January during the Dance Days festival. The group is free, and no prior dance experience is needed! Venue is mobility accessible. ASL interpretation is available, and a vlog (ASL video) is below. Accessible washrooms include a gender-neutral washroom. The group facilitator is Joanne Cuffe. The project is in collaboration with the Victoria Disability Resource Centre, who are looking after registration. For more information or to register for the Mixed-Abilities Dance Group click here, or email: dance@drcvictoria.com or phone: 250-595-0044. The group will work together to support each other and to learn integrated dance skills, such as informal describing and movement translation. There will be a orientation to accessibility roles on September 27th. The pilot project has been made possible with support from CRD Arts Development, Made in BC – Dance on Tour’s community engagement program, and Garth Homer Society providing the space.